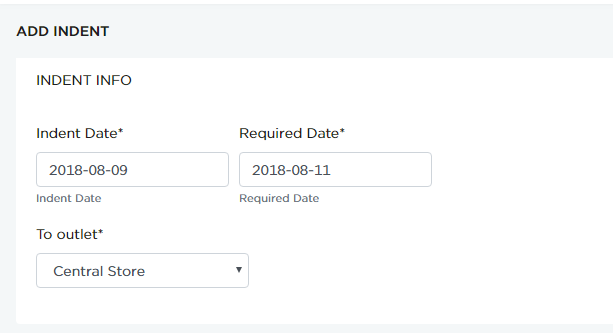 In this page, you can raise indents and request for required items. Based on request for items, the recipes are issued. Go to TRANSFER -> RAISED INDENTS to add and view the raised indents. All the raised indents are entered and recorded in this page. Click RAISE RECIPE INDENT button to enter recipe indents. Consider, recipes are centrally produced in a store and you are requesting for recipes from your outlet. Select the Cost Center and Kitchen type (or other categorization as applicable) from dropdown options. You can tag indents based on applied categorization. This helps in filtering and listing based on applied tags. Click Save to save the indents.